Originally published in print, now ported to web. First... please note as of 2016 this website is UNDER DEVELOPMENT -- portions of this site are not functional. Feel free to explore around to see what's coming. We figured that instead of keeping the development process private, we'd just go public and let things fall where they may. Thus, if you find any useful info please enjoy, otherwise check back as I'm working on things as often as possible. Our formatting and design is minimal at this point, and I'm sure plenty of glitches exist. We're taking care of all that, but the bare bones you can now get here should suffice to keep you skiing! This especially so with spots such as Marble, Colorado and Independence Pass. So enjoy, and please return often as we're working hard on adding photos, cleaning up the design, etc. Please no comments or complaints yet, as nearly any glitches or problems you see we are already aware of and working on. 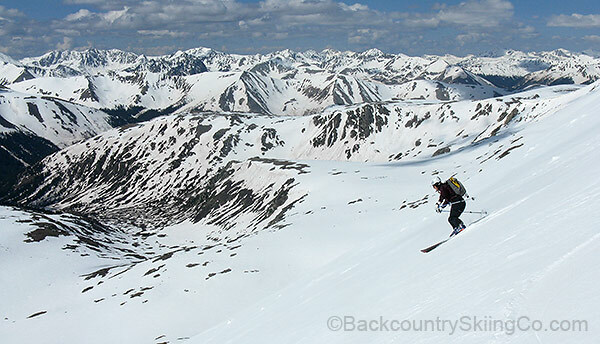 Important: While this is not a blog or news site, we post plenty of current Colorado backcountry skiing information over at WildSnow.com. For example, click here for an Independence Pass skiing specific search that'll give you dozens of articles to read. The back story: Around thirty years ago circa 1984, when I wrote the first words for what you would eventually read here as an online guidebook, ski mountaineering had seen a dramatic period of growth in Colorado. That trend has continued -- and recently accelerated. Now other guidebooks (and websites) have been published, terrific hut systems have been built—our sport is mainstream. Moreover, ski and snowboard mountaineering equipment has been vastly improved, and the skill level of people going into the mountains has grown notably. On Geissler Number One, looking southwest, Independence Pass backcountry skiing. As the sport of backcountry skiing developed here in Colorado, I wrote and published in 1986 the state's first modern ski mountaineering guidbook, Colorado High Routes, which was second editioned and substantially improved in 1991; renamed Dawson's Guide to Colorado Backcountry Skiing. Due to the financial issues of publishing a small demand book that required frequent updating, Dawson's Guide went out of print a few years ago. My intention back then was to possibly port to web, but due to the work involved that process has been slow in coming. This is an attempt. This website covers backcountry glisse, which means sliding down snow on an edged tool such as snowboard or ski. Covering both methods results in a communication problem, because it’s awkward to write both words whenever mentioning the sports. Herein, the words "ski," and "glisse," are used as inclusive terms for skiing and snowboarding. Also note that several of Colorado's 14,000-foot peaks are within the area covered by this website. Most such "fourteeners" are not covered here, but are detailed in Dawson's Guides to the Colorado’s Fourteeners guidebooks. For the purpose of this guidebook, the Elk Mountains are assumed to extend from Mount Sopris to Independence Pass, with the Roaring Fork Valley forming the northern border, and the Ohio Creek Drainage forming the southern. The West Elk Mountains extend south and west from Mount Sopris toward Montrose, though the boundaries of this range are somewhat ambiguous. The Sawatch Mountains take the area between Vail and Aspen, as well as covering a large area this website does not include at this time. These are generalized definitions, but will suffice for organizing route information herein. The mountains described in this book consist mostly of sedimentary rock and metamorphosed sedimentary rock. The most striking occurrence of this is known as the Maroon Formation because of its distinctive reddish colors. The Precambrian cores of massive uplifts form the few granitic peaks of the Elk Mountains. As with all Colorado mountains, glaciation completed the major formative processes by carving cirques, aretes, and steep-sided, flat-bottomed valleys. Presently, water erosion is the only major force shaping the land. Nonetheless, several good-sized glacial remnants remain in the Elks and Sawatch, including large snowfields in Montezuma Basin and Snowmass Mountain Bowl. These miniature glaciers show evidence of the cyclic nature of the ice ages: they wait patiently now for a colder climate or more abundant yearly snowfall; both will feed them and they will grow again. The information presented within this website is based upon the experience of the authors and their sources and might not necessarily be perceived as accurate by other persons; therefore, extreme care should be taken when following any of the routes described here. This website is not intended to be instructional in nature but rather a guide for mountaineers who already have the requisite training, experience and knowledge. An advanced level of expertise and physical conditioning is necessary for even the "easiest" of the routes described. Proper clothing and equipment are essential. Failure to have the necessary knowledge, equipment, and conditioning will subject you to extreme physical danger, injury, or death. Some routes have changed and others will change; avalanche hazards may have expanded or new hazards may have formed since this website's publication. Moreover, this website does not list every hazard you may encounter. One element of the beauty, freedom, and excitement of wilderness is the presence of risks that do not confront us in civilization. When you travel in the backcountry you assume those risks. They can be met with reasonable safety, but only if you exercise independent judgment and common sense.